The Royal Canadian Legion says almost half of Canada’s population will don a red poppy for Remembrance Day, but the plastic and felt flowers are backed by more than just a pin. Martin says people must get written permission from the Legion before using the poppy symbol. He says the trademark is crucial because funds donated through the poppy campaign go to veterans and their families. According to the Legion’s 54 page Poppy Manual, the trademark does not cover use of the actual poppy flower, unless a poppy is being used in relation to Remembrance Day or to misrepresent the Legion’s symbol. The Legion relies on its 275,000 members to pick up on any misuse of the symbol, and Martin says most infractions are resolved easily. “The people who are legitimately trying to raise funds for veterans are very cooperative. The ones that are shady are not,” he says. Some websites selling poppy merchandise without proper permission ignore the Legion’s requests, Martin says, or send back what he calls “fake server return messages.” Martin adds that there are several websites powered by Shopify that are selling merchandise against poppy trademark. “But it is hard to hunt those particular ones down,” he says. Tom Wright, a veteran and vice-president of the Somme Legion Branch 31 in Dartmouth, agrees that the trademark is critical to the Legion’s goal of helping as many veterans as possible. “It’s the emblem of sacrifice and remembrance,” he says. The Legion also has specific poppy wearing rules. It should be placed on the left breast, close to the heart and should not be fastened with any pin but the one provided. 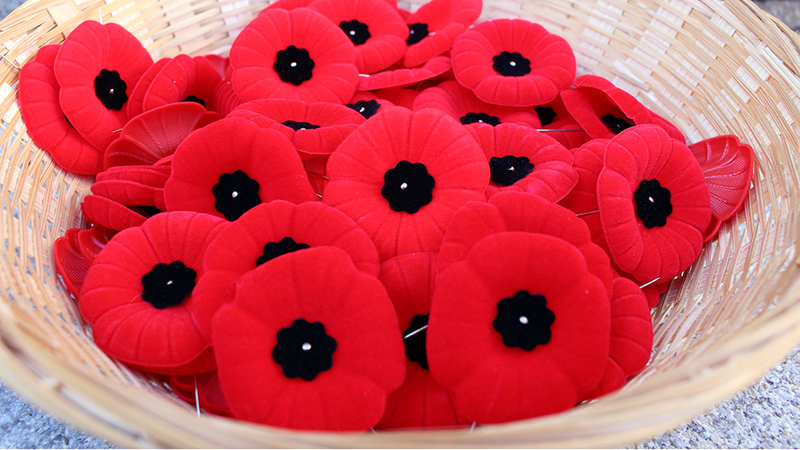 The poppy should also be worn from the last Friday in October until the end of the day on Nov. 11. On Remembrance Day, wearers are permitted to place the poppy on a tomb, gravestone or wreath after a ceremony. And if a person finds a poppy on the ground, the Legion says it is respectful to pick it up and dispose of it properly.